We had a lovely 3-day weekend! On Friday we departed home at 7 a.m. for Duluth and our first stop was Chester Bowl so that Patrick could run in one of his favorite spots and Charlotte could play off some energy built up by the car trip. Here's a photo of Charlotte after she and I checked out the water running through Chester Bowl. It was a beautiful day in Duluth! Oh how we miss living in Duluth, but we agreed we need to go back in April when it's spring in the Twin Cities and still very much winter in Duluth. We braved the Grandma's Marathon traffic and parked at the DECC. It was worth it because moments after we arrived at Bayfront Park we got to see a ship depart the harbor. Charlotte ran the Whipper Snapper race! She was pretty pumped to run and we think she is getting close to running without Patrick. He said he put her up on his shoulders so she could see the mascot race, which preceded the Whipper Snapper, and she anxiously scrambled down when the first wave of 4 and under kids took off. She was not about to have a late start! We stopped by the Expo to pick up my packet for the half marathon and Charlotte's favorite part was playing in the curtains set up for the pasta feed. We've taken to counting to 3 to get her to do things and this was one time counting to 3 was necessary. I don't know why this works. I rarely have a plan for what to do if she's not complying by the count of 3. Hopefully she doesn't test this anytime soon. After packet pick up we enjoyed a pre-race meal and celebrated the eve of my 30th birthday with dinner at Little Angie's Cantina. I don't have any pictures of the race (the Gary Bjorklund Half Marathon) because I was running, but it was pretty fabulous. I thought it would be a fun way to spend my 30th birthday and it was! The weather was perfect - cool, partly cloudy, maybe a slight breeze at our backs. Patrick, Kelly, and Pat's parents all made signs that helped keep me going through the last few miles, and it was fun to celebrate with them at the finish. Afterward we went to a new-to-us cafe on Superior Street, Takk for Maten, and I enjoyed lefse with butter and brown sugar - it was delicious. After lunch Pat's family departed Duluth and the three of us took naps at UMD. Then, after we enjoyed our annual malt from the Portland Malt Shoppe, we decided to check out the Duluth Children's Museum (pictured above). It was a fun way to get out of the rain and do something new in Duluth! This morning the celebration shifted from my birthday to Father's Day! Happy Father's Day to all the Dad's out there. We had intended to leave Duluth at 10:30 a.m. for a Father's Day lunch in Eau Claire, however, we had car trouble. We were at Tires Plus when it opened at 9 a.m. and despite the staff person's initial concern that they wouldn't be able to fix it until Monday, we were on the road by noon with new brakes! Here we are killing time at Caribou while our car was assessed. We were glad we thought to grab crayons and books for Charlotte. Then, on a whim we got Charlotte her first hair cut! Here she is after the cut, the stylist only took at most an inch off but it was good practice for Charlotte. She was a bit nervous but she sat on my lap, answered all of the stylists questions, and stayed still for an even cut. Shortly thereafter we got the call that our car was ready and we were off to Eau Claire! Grandma and Grandpa Russell got Charlotte this great bat and ball. Charlotte may or may not have hit Dad's hands a few times, but she definitely connected with the ball more than once! And because I'm always up for celebrating my birthday I was excited to blow out candles! Charlotte helped and to be fair, the cake was for "Katie and the Dads" :). It was great to see Charlotte's Great Grandpa and Grandma Mehls even if it did start raining after our arrival prompting a move from the nice deck indoors. I think this is why we didn't get any family photos this gathering! Below are a couple shots of Charlotte playing with Grandpa and Grandma Russell. We had a great weekend and I'm walking pretty well although going down stairs/hills is not my favorite thing right now. Patrick just reminded me that tomorrow will probably be the worst day as far as muscle soreness goes...thanks dear. Charlotte has become quite the animal lover! Memorial Day weekend Charlotte and I visited my parents and after a few hours she petted Kira Bear and even played fetch with her (see photo below). 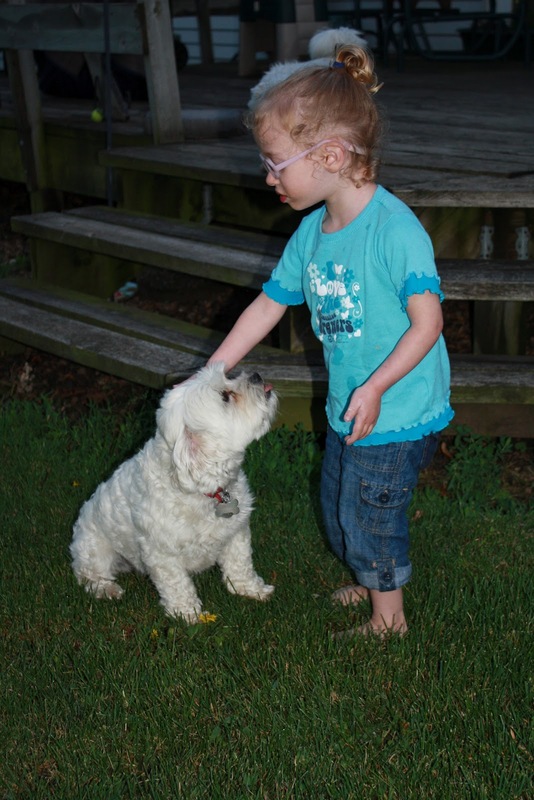 The next morning she had almost forgotten her new friendship with Kira and instead wanted to snuggle with Big Gray. Unfortunately Big Gray didn't reciprocate the feeling and eventually hid behind the couch where she couldn't be reached. Baby steps. AHH! I got new glasses! 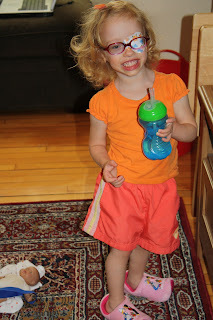 We recently learned that kids outgrow their glasses in 18 months or less - yikes! We found a great boutique in Uptown called Glasses Menagerie and picked up a new pair of frames. At her last eye exam her prescription changed only slightly, but it's nice that she has the latest prescription as well. And the best part - they are transitions lenses! 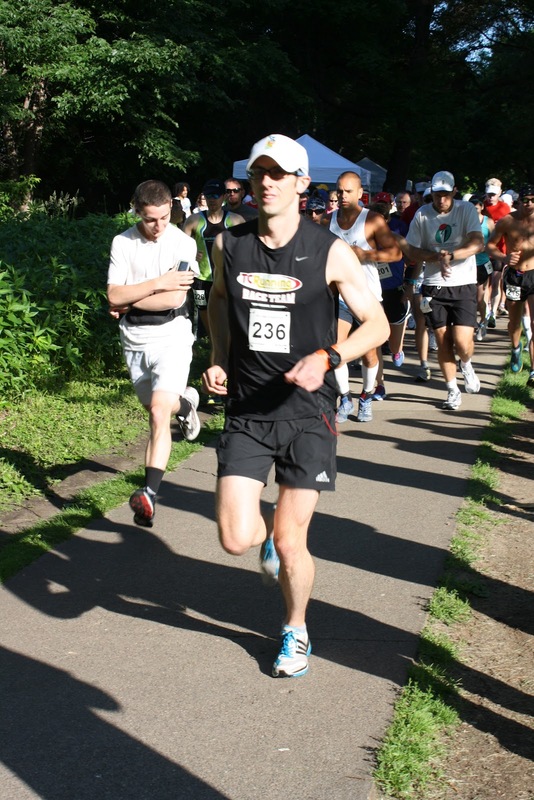 Last weekend Patrick set out to run 50 miles at the FANS 12 and 24 hour race around Lake Nokomis. He made it 43 miles before stomach cramps sidelined his efforts and then we all cheered for our friend Sonja who was among the brave (read insane) souls running for 24 hours. Charlotte is becoming quite the running fan! Here she is clapping for the runners and saying things like "Go Runners!" and "Yeah Runners!" Daddy's biggest fan crashed for her nap about 3 hours into the race. She is such a good napper that she slept for 1.5 hours while people around her cheered for runners. After Patrick's finish we went home and cleaned up, played, rested, and ate dinner. 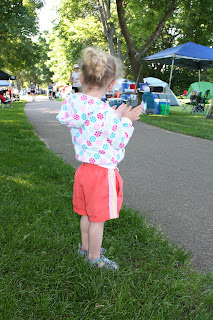 Then, after all that, we grabbed DQ on our way back to Lake Nokomis to cheer on those who were STILL RUNNING. The race finished at 8 a.m. and I can only imagine those runners are still sleeping, over a week later. Grandma and Grandpa Russell went to Vegas this week and we got their plants to water! Charlotte took primary responsibility for this job as she loves the spray bottle. 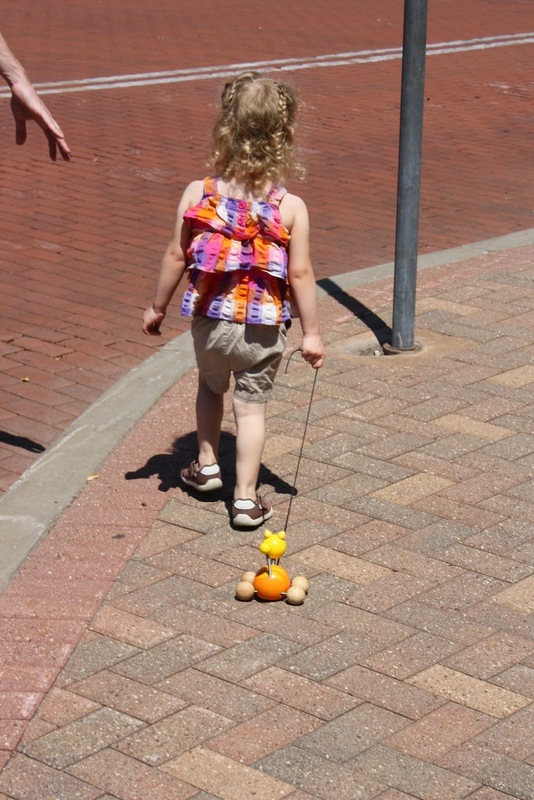 Here is Charlotte walking her dog on the streets of downtown St. Paul (note: her "dog" is a wooden cat on wheels handed down to her by our wonderful neighbor girls). Last night she named her dog Kira Bear (after Grandma and Grandpa Distad's dog) and has insisted upon taking her absolutely everywhere today. This afternoon she renamed, for a brief period, the dog Sandy and she and I replayed the scene from Annie where Annie needs to call Sandy to evade the dog catcher. Here's a fun photo to wrap-up the blog post. We love the slippers Charlotte received from Grandma and Grandpa Russell from their trip to Amsterdam. She even wore them today in spite of the 90 degree temps. We're going strong on the no tube feeds! We've adjusted easily to needing to stop and eat at mealtimes rather than just hooking her up to her tube and plowing through life. 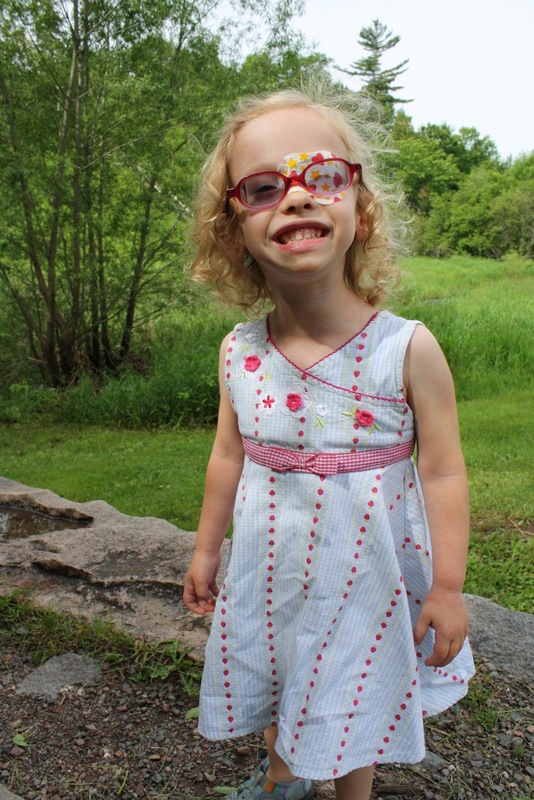 Her weight has been stable and we're hoping she can pack on a few ounces before we see her pediatrician in August.